We parked in the Pine Point arena parking lot and walked down the hill to the river. During the winter months the long steep run makes this one of the best toboggan hills in the city. It was 19 degrees and sunny when we set out. The trail runs under the 401 into a small park that extends to the Weston Golf and Country Club. Crawford-Jones Memorial Park is named after Jim Crawford and Herb Jones. Jim Crawford was a police officer and Herb Jones a contractor in 1954. On the night of Hurricane Hazel they took a small boat along the Humber River and rescued dozens of people stranded in their homes. 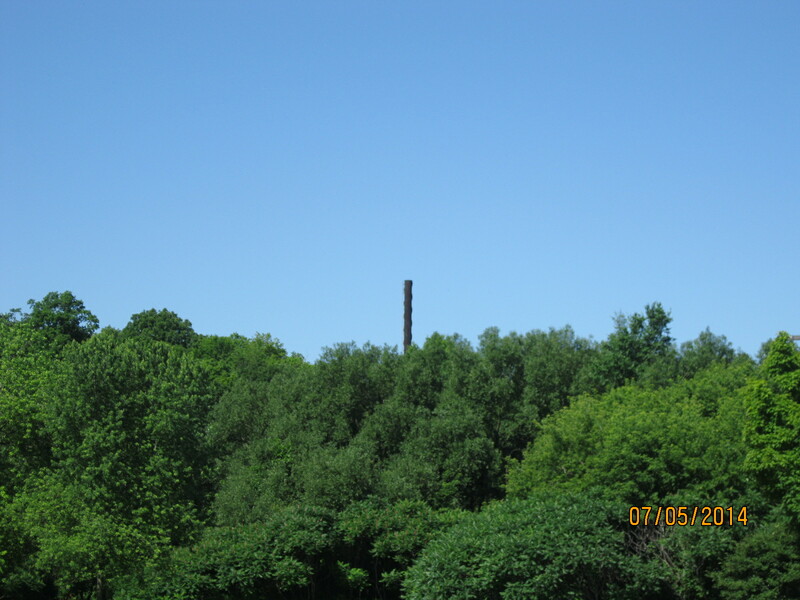 The picture below is taken from the park on the east side of the river looking at the stack on the steam plant on Resources Road. There is a spiral staircase running up the outside of the tower. Along the edge of the river we saw a couple of dead Crayfish. 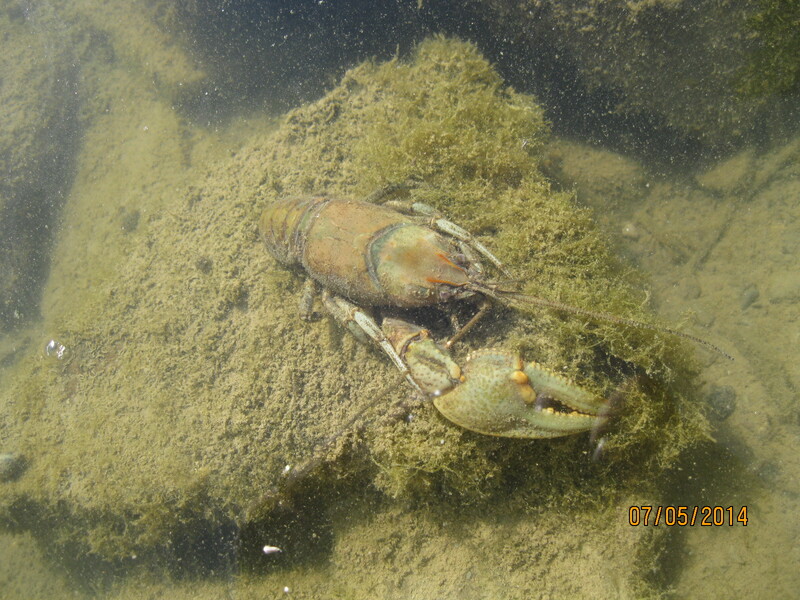 Crayfish are fresh water lobsters and live in places where the water does not freeze to the bottom in the winter. They don’t tolerate polluted water which suggests that the Humber is pretty clean these days. This was a larger specimen, about 10 cm long, but is missing one claw. Most of the parks we hike have evidence of a local coyote but we rarely see one. Coyotes are related to the wolf and have become very successful in urban areas. Coyotes hunt a variety of small animals and will even eat a crayfish if the opportunity presents itself. 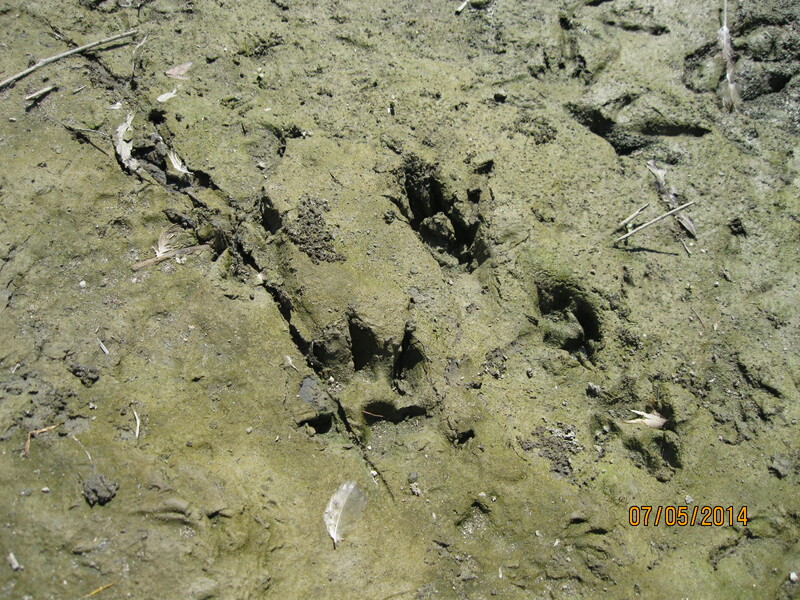 The tracks below were found along the edge of the river. North of the 401 we followed the embankment on the side of the ravine. This area is known as Pine Point Park. Part way along we found a 1963 Pepsi bottle in an area where a lot of old bricks had been dumped. 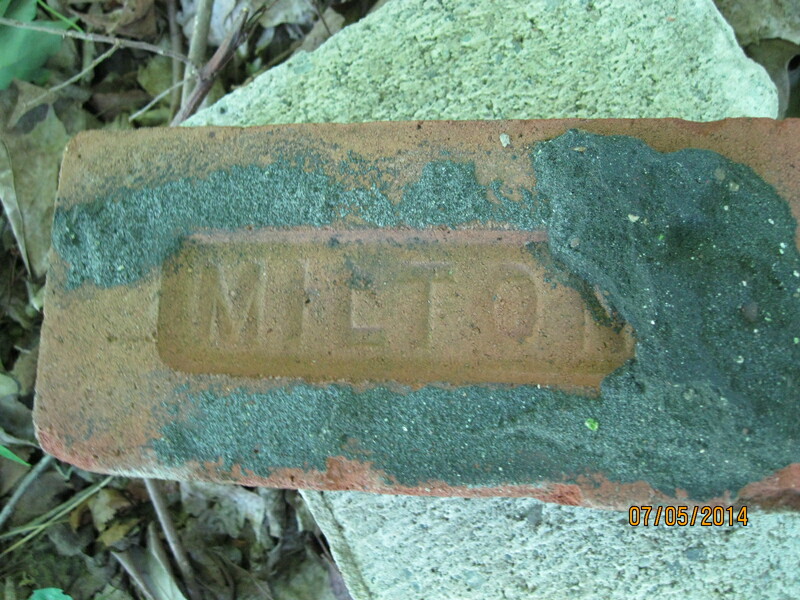 Among several manufacturers we found Milton Bricks. In 1877 when the Credit Valley Railway passed through the area of Milton they found a lot of clay and shale. Lot 1 Concession 1 of Esquesing Township belonged to Duncan Robertson and a large amount of Medina Shale was found here. His son, David, started Milton Pressed Brick and Sewer Company. Their bricks were pressed before baking and were a much higher quality brick than much of their competition. By 1901 they were considered to be the best bricks available on the continent. They employed 200 people at their peak but closed in 1974. Ontario is unique in the large amount of it’s buildings which are made of bricks. In 1931 27% of Ontario buildings were built of brick while only 6% of Quebec buildings were and 2% or less in other provinces. Ontario was rich in clay and had a huge export market for lumber which led to this trend in construction in the province. 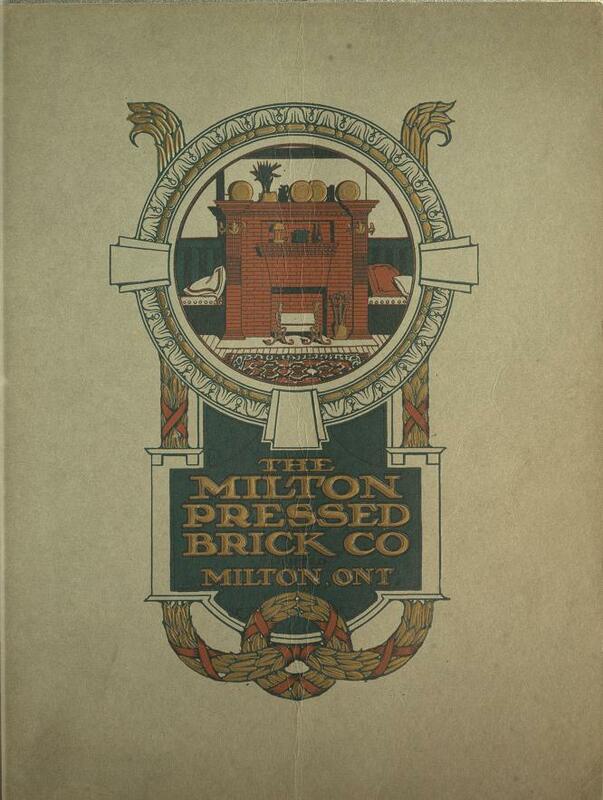 By the early 1900’s Milton Brick was publishing a catalog of beautiful brick fireplace designs that could be ordered. A little further along we found the half buried artifact that is in the cover photo. We excavated enough to determine that it is an old hand crank broadcast seed spreader. 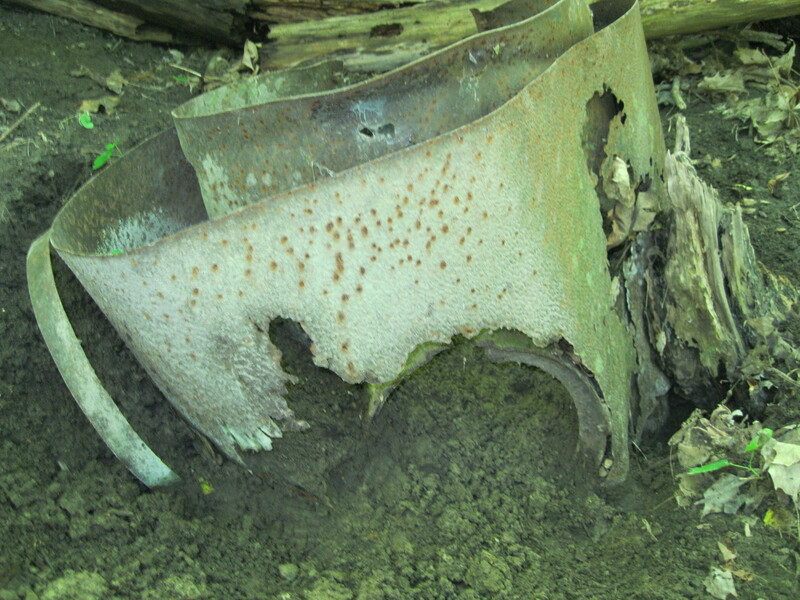 It is rusted right through and likely dates to the 1930’s. As we were starting downhill to make our way back we found and old set of wooden stairs on the side of the hill. 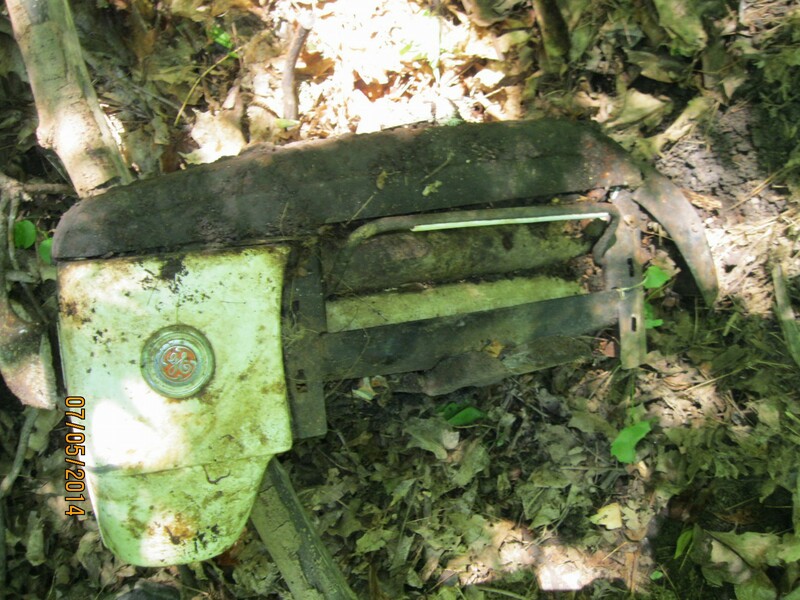 Beside here in the little ravine we found the wringer from an old General Electric washing machine. Edison General Electric Company was founded in 1889 by American inventor Thomas Edison. Edison is credited with inventing the long lasting light bulb, phonographs and the motion picture camera among his 1,093 patents. This washing machine likely dates from the 1940’s or early 1950’s. Clothes would have been taken out of the washer and pressed between the two rollers to squeeze the water out of them. This machine had a quick release handle, seen open on the right hand end, to let you get your hand out when it got caught in the rollers. Earlier versions didn’t have this safety feature and were nick-named “manglers” for obvious reasons. The hillside trails are fully overgrown and its quite possible to walk within a few feet of something interesting and never see it. 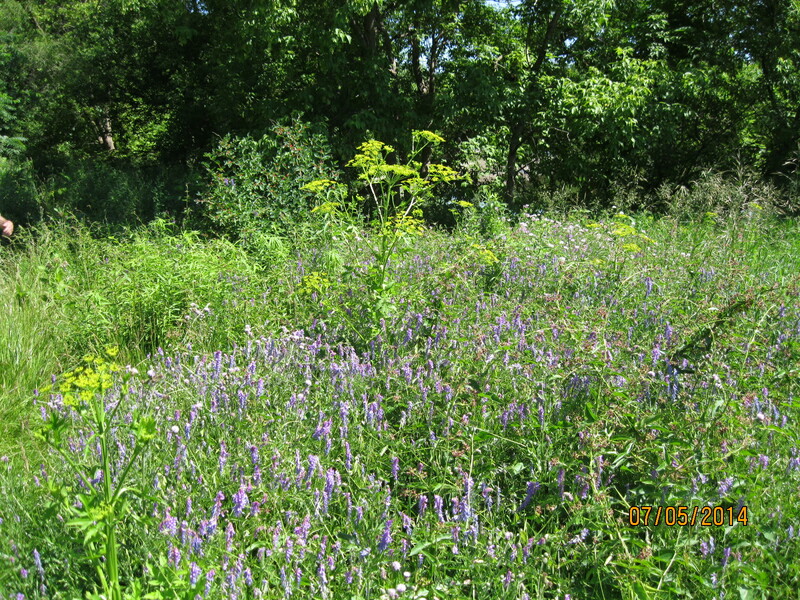 The woods and fields are full of colour and purple is now prominent. Asters, thistles, bellflowers and violets abound. This entry was posted in Humber River and tagged General Electric, GTA, Hiking, Humber River, Milton Pressed Bricks, Seed spreaders, Toronto on July 6, 2014 by hikingthegta.